The Age 3 Survey took place in 2004, with 15, 590 families and 15,808 children taking part – including 692 families and 699 children who joined the study at this age. GfK NOP Social Research interviewers carried out the Age 3 Survey in England, Wales and Scotland, and Millward Brown Ulster carried out the survey in Northern Ireland. By age 3, toddlerhood was behind you and we wanted to see how much you were learning at home and at pre-school to make you ready for school proper. The first three years of life are a period of incredible growth in all areas of a baby’s development. Between birth and age 3, a child’s brain undergoes a huge amount of change – synapses (which connect all the parts of our brain) are formed at a faster rate during these 3 years than at any other time of life. By visiting you at the end of this important stage of growth, we could measure your physical growth, what you knew, what activities you were doing. Not only was this important in and of itself, but there is evidence that all these things really matter for later on in life, so we wanted to be sure to capture them well! We asked your parents to tell us about your family and home life again and whether there had been any changes. We asked about the home you lived in, whether you’d moved since age 9 months and what the neighbourhood was like. We asked your parents a lot of questions about how you were developing, the sort of activities you did and your health. There were some questions about older brothers and sisters if you had them, and in some families your older siblings completed their own questionnaires. We also asked your parents to take a sample of your saliva from your cheek to see if you’d been exposed to common childhood infections. What did the interviewers do with you? The interviewers measured your height and weight to see how you were growing. They also did some activities with you to see how you were developing; including naming pictures and recognising colours, letters and numbers. What else did we ask? We asked your parents if it was okay if we got information from the National Health Service (NHS) about any times you had to go to hospital, and the reasons why, from when you were born up to your 7th birthday. The NHS collect information when people go to the doctor, go to hospital or visit any other health professional. 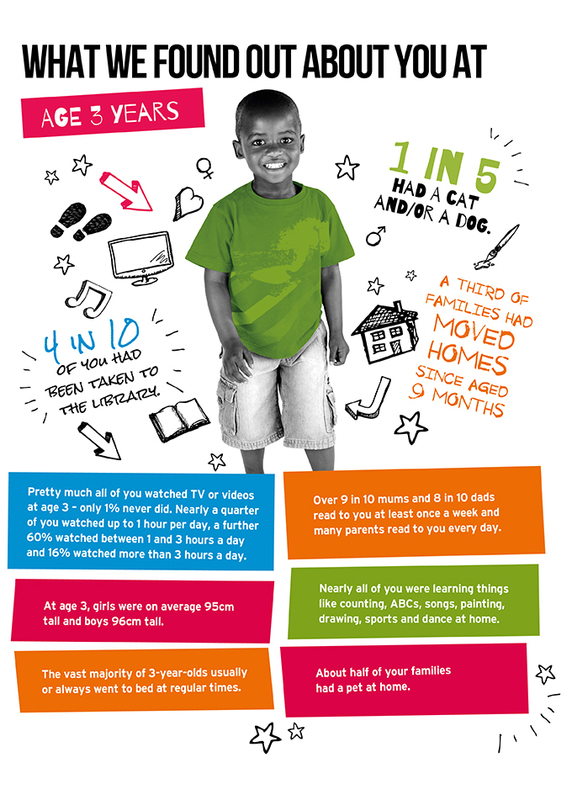 WHY IS IT IMPORTANT FOR YOUNG CHILDREN TO GO TO BED ON TIME? Researchers compared the bedtimes of 10,000 children in Child of the New Century. They found that children who went to bed at different times every night were more likely to have behaviour issues, including hyperactivity, conduct problems and emotional difficulties, than those with regular bedtimes.